The records submitted for this Atlas were typical of any of the last 35 years. 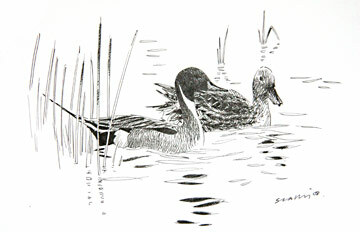 Pintails have not been found breeding in the county since a female seen with young at Frodsham Marsh in 1969. In many years pairs are present, sometimes displaying, as during this Atlas period. There were no records in 2004. In 2005 a pair was found near the river Weaver at Aston (SJ57N); the male went into eclipse plumage in July. In 2006, three pairs displayed at Inner Marsh Farm (SJ37B), another pair was present at Aldford (SJ45J), and a single female summered in Runcorn Town Park Lake (SJ58L). Their few breeding sites in Britain are mostly open grassy areas adjacent to shallow eutrophic freshwater or brackish coastal pools, with a copious supply of invertebrates, especially small mud-snails. The national total of breeding birds was only 12-22 pairs in 2004 (Holling et al 2007).